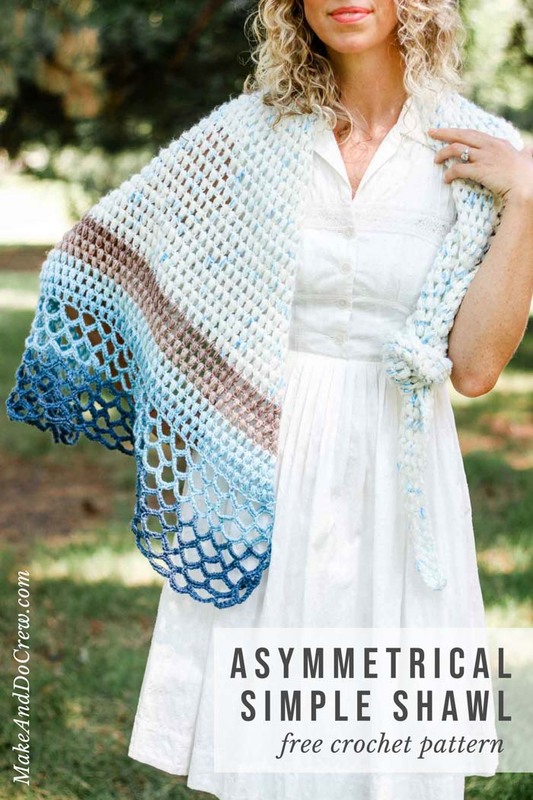 This elegant asymmetrical crochet triangle shawl pattern is simple to follow and fun to wear year round. Get the free pattern below or purchase the ad-free, printable PDF with stitch chart for $2.99 here. 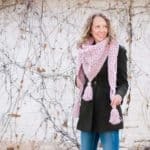 This free asymmetrical crochet shawl pattern is part of a collaboration with my friends at Lion Brand yarn. This post contains affiliate links. 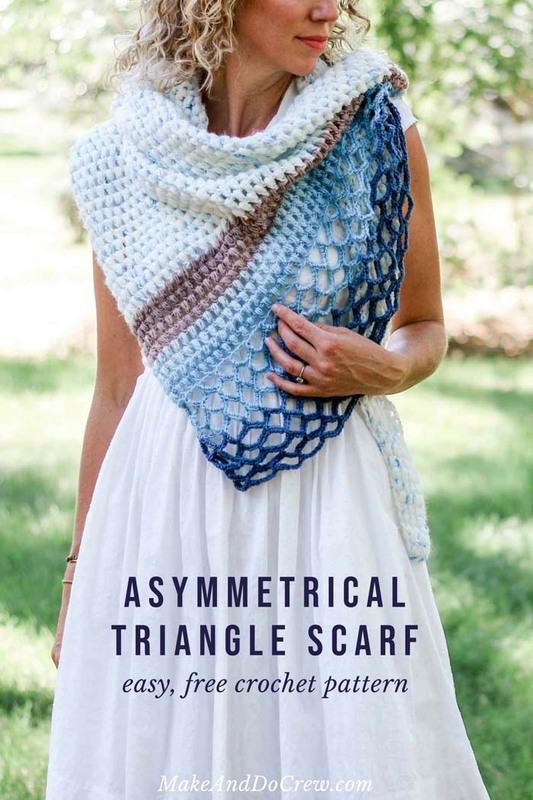 Whether you’re headed to the beach, a wedding or just need protection from some overzealous air conditioning, this asymmetrical crochet triangle shawl is the perfect go-to way to wrap up this summer–and for the rest of the year! 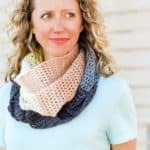 I’ve shared several free crochet shawl and triangle scarf patterns here on the blog and several even include video tutorials. 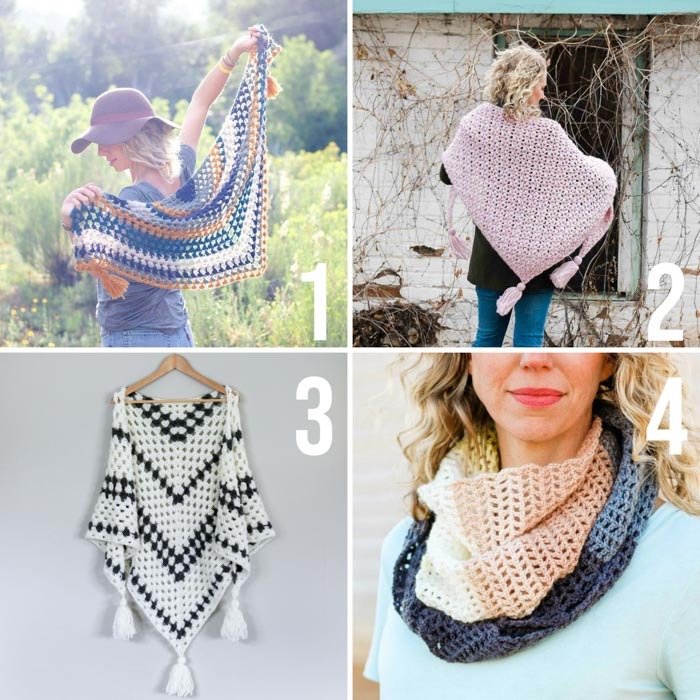 Here are a few of the free crochet shawls patterns Make & Do Crew readers have likes best, but you can always find all my free scarf patterns here. This easy crochet shawl pattern is technically a scalene triangle. Haven’t heard that term since 8th grade geometry? Let me offer a refresher–because I just had to google it too! A scalene triangle has three different sides of three different lengths. In this free crochet shawl pattern, we achieve that shape by increasing on one side of the pattern and not increasing on the other. Then some very simple lace “waves” are added at the end of the shawl, creating sides of three varying lengths. The benefit to this shape of shawl that I’ve found is it allows you to wear it in several ways to achieve a really different look. 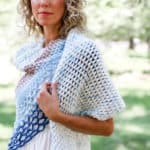 Would you believe that the beachy look of this free crochet shawl pattern is achieved with two affordable, washable baby yarns? 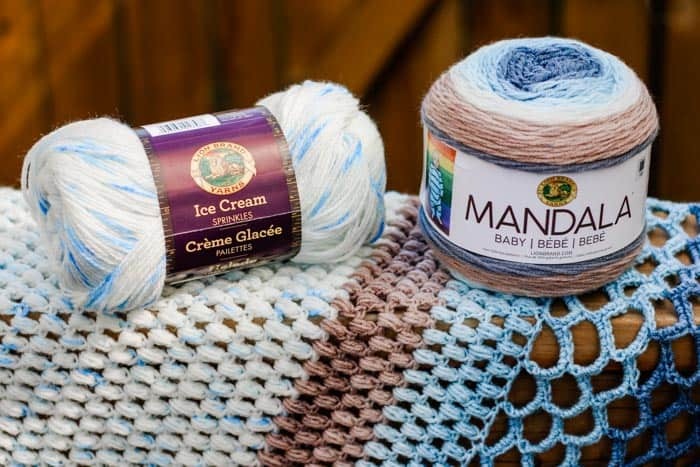 A while back, I realized that Lion Brand Ice Cream yarn and Lion Brand Mandala Baby yarn had almost an identical gauge according to their labels. After some experimentation, I decided there was a way to combine the two that was sort of greater than the sum of the parts. I really think the final effect is quite soft and elegant, all while still being machine washable! A Stitch Chart — Visual Learners, Rejoice! 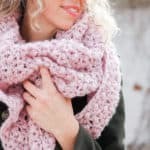 This crochet shawl pattern really is pretty easy, but we all know how crochet pattern language can sometimes take something simple and make it sound scary and complicated. That’s why I love crochet stitch charts so much! As a bonus in the ad-free, printable PDF, I’ve included a stitch chart that shows both the puff stitch section of the pattern as well as the “Waves” section. If you’re a visual learner or if you’re having any trouble knowing when to increase or where to place your stitches, I really think this printable PDF is worth the investment. You can purchase it here. I hope you find it useful! Add it to your Ravelry favorites or queue HERE. 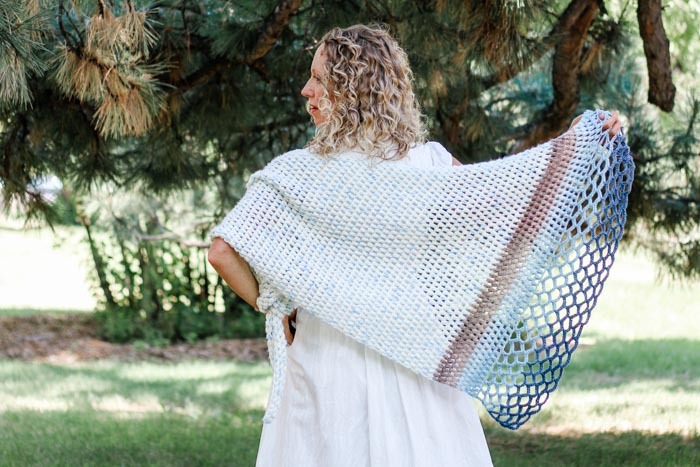 This elegant four-season shawl is much simpler than it looks. You’ll have the stitch pattern memorized before the sun sets behind the sea! Basic puff stitches combine with a lace trim to make for a shawl that’s a perfect mix of squish, fluff and fancy. And the yarn? Two easy care acrylics come together to create a scarf that’s as uncomplicated to wash as it is to crochet. Skills required include double crochet, chains and single crochet. 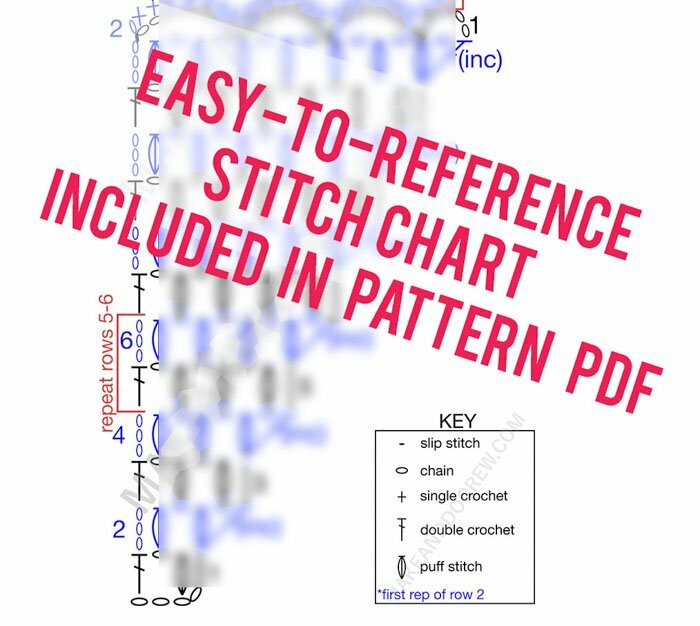 Less experienced crocheters might find the stitch chart at the end of the pattern PDF a helpful addition to the written pattern. Ps – puff stitch: [yo, insert hook as directed, yo, draw a loop through] 3 times in same place, yo draw through first 6 loops on hook, yo, draw through remaining 2 loops on hook. 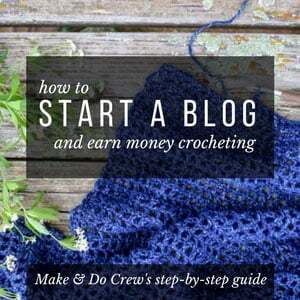 • To make a larger shawl, simply continue in Puff Stitch Pattern or Chain Waves Pattern (or both) for additional rows. • Increases always take place at end of even-numbered rows (marked “inc”). Work last dc at end of inc rows loosely. It can be helpful to place a stitch marker on inc side to remind you to increase at the end of each row on that side. Attach AC. Work 8 additional rows in the Row 4 and Row 5 pattern, changing colors within accent color as desired. (Sample is worked with 4 rows each of two different colors.) There should now be 100 total rows and 51 Ps in final row. For more instruction on deconstructing yarn cakes to create your own color gradients, see this video tutorial. If desired, switch to next color of AC skein in the final yo of last dc in Puff Stitch Section. Turn. Note: If you added or subtracted rows and ended the Ps section with an even number of Puff stitches, you will sk only 1 Ps at end of row before working sl st in top of tch. Row 14 (RS): Rep Row 2. Row 15 (WS): Rep Row 3. Row 16 (RS): Rep Row 4. Fasten off. Weave in remaining ends. I love this idea and it looks easy. Thank you for doing some unique, fun patterns. It’s my pleasure! Thanks Renee! This lovely, thank you for sharing your pattern. You’re welcome! Thanks for being here, Carol. I’m so glad you found this then! I hope you enjoy! 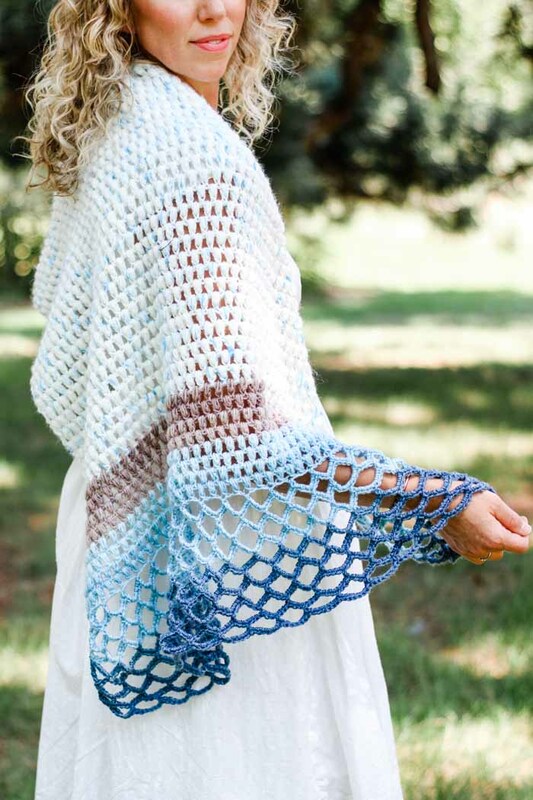 Hi, I love your pattern for the Rising tides shawl. But, I ran out of the sprinkles yarn at 7 more rows to crochet! UGH! I measured and my gauge is correct and the yarn yardage is correct also. Has anyone else encountered this? I did order another skein of yarn as I want it to look right. I’m so sorry to hear that! I actually had extra Ice Cream in mine. (I wish I could just give it to you!) Since yarn yardage is measured in weight and not length, I’ve noticed it can vary skein to skein. You’ll have plenty of extra of the self-striping yarn, so feel free to work extra rows in that. I think that would look beautiful too. cross stitch pillow. Love your patterns!